I found a copy of "The Turnip Princess" in a local library! 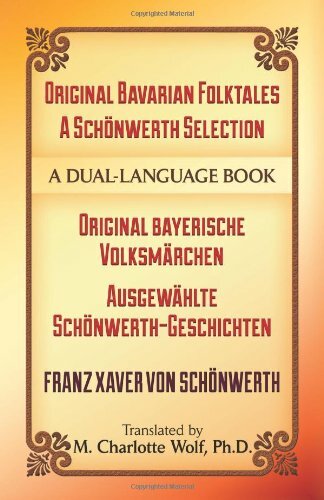 This is the collection of Schonwerth tales translated by Maria Tatar. I have the Schonwerth collection edited and translated by M. Charlotte Wolf, and have posted on it before, but wondered how these collections compare. 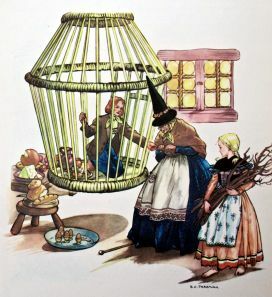 I've just been browsing through "Turnip Princess", but there are some really interesting gems in there, including a version of Cinderella ("Ashfeathers"; it is a friendly dwarf who helps Cinderella get her dress and not a godmother or the spirit of her mother). 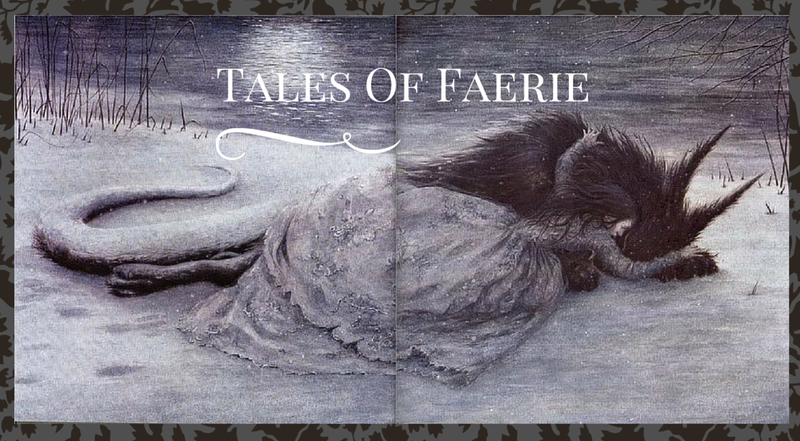 There are, of course, many stories that aren't directly connected to our most popular fairy tales. 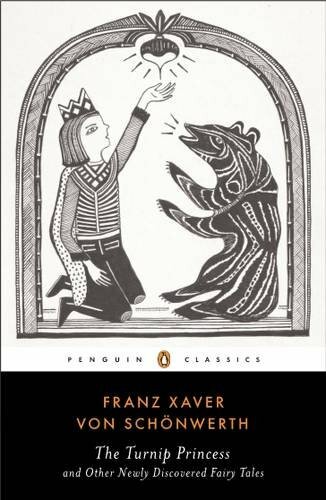 Some of them are very dark and violent, as many unedited folktales are, and unlike the Grimms there are more references to sexuality, although none of them too explicit, as compared to some of our modern entertainment. The version of "Tom Thumb" is a good example of the physical and scatological humor found in the volume. Thumbnickel crawls through the keyhole into the treasure chest of the merchant who bought him, and tossed out the coins to his father. 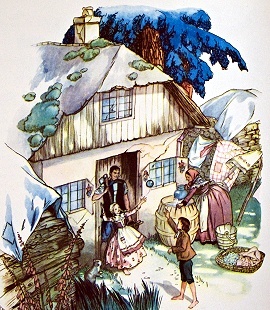 To avoid being whipped by the merchant he hid in a barrel of salt-but then the salt was fed to the cows, and Thumbnickel is passed through a cow (fully intact of course) and stuck in a pile of dung, about to be eaten by a mouse who is about to be eaten by a fox, until his father comes plowing nearby and manages to save him. 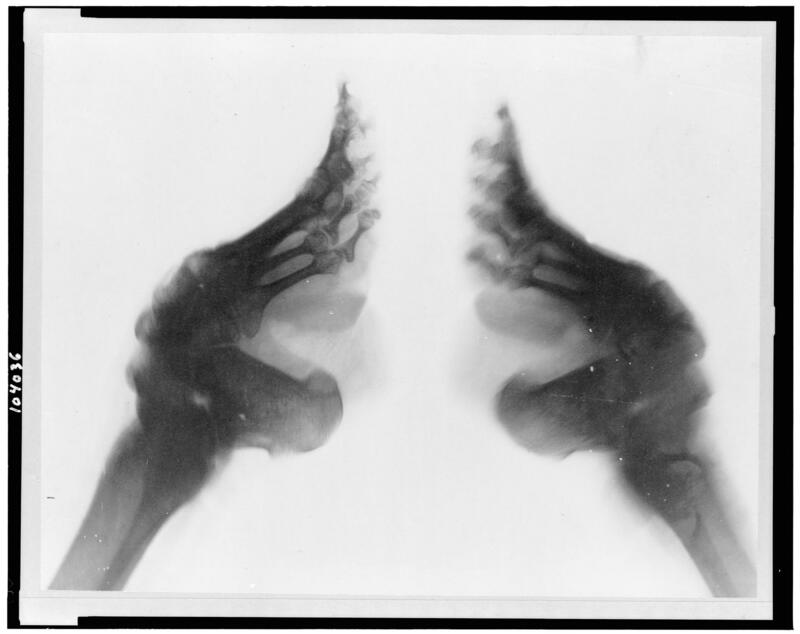 It seems gross but at the same time, when people lived in an age before indoor plumbing and many of our modern conveniences that allow us to be more discreet about our bodily functions, I guess it was better to embrace those aspects of life with humor than to stress out about them too much! And as we know, that type of humor is still enjoyed by children especially. Both volumes have the tales separated into categories, which is really helpful. And it doesn't appear that there's much duplication of tales in each volume (Schonwerth had collected around 30,000 pages of text!! ), so if you have one book and are considering getting the other, I consider it worth it to have both! You can compare versions of some tales side by side (such as "The Valiant Little Tailor," which I posted about here but mentioned Tatar talks of details that weren't in my version-they can be found in "Turnip Princess"). Wolf's collection has more tales (150 as opposed to Tatar's 72) but the stories found in Tatar's collection seem a little more easily digestible-shorter, faster paced, and more like the typical fairy tale formula we are used to. Although one major perk in the Wolf volume, for those of you who speak German, is the dual translation feature-you can read the original German on one page and the English on the other. 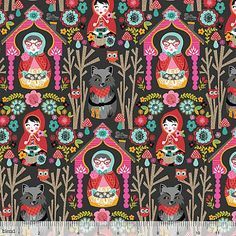 Closeup up print-Matryoshka inspired LRRH characters! Little Mermaid Ipad/Tablet Bag-on sale for $28! Any other fun fairy tale-related stores/products/gift ideas out there? “One of the earliest surviving French luxe mules, just the kind of slipper Cinderella wore to the ball, is a study in green and white. 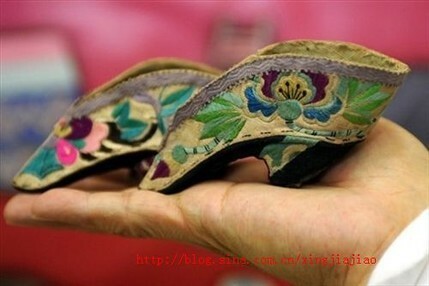 Made of white leather with a green leather welt and green embroider, it features the curvy Louis heel” (85). DeJean, Joan. The Essence of Style. "Louis XIV similarly used propaganda to encourage the nobilities’ dependence on and obsession with fashion. At the time the belief was already in place that one’s outside appearance reflected not only one’s personality but who one was in terms of social status. The more expensive and fashionable, the more important one was. 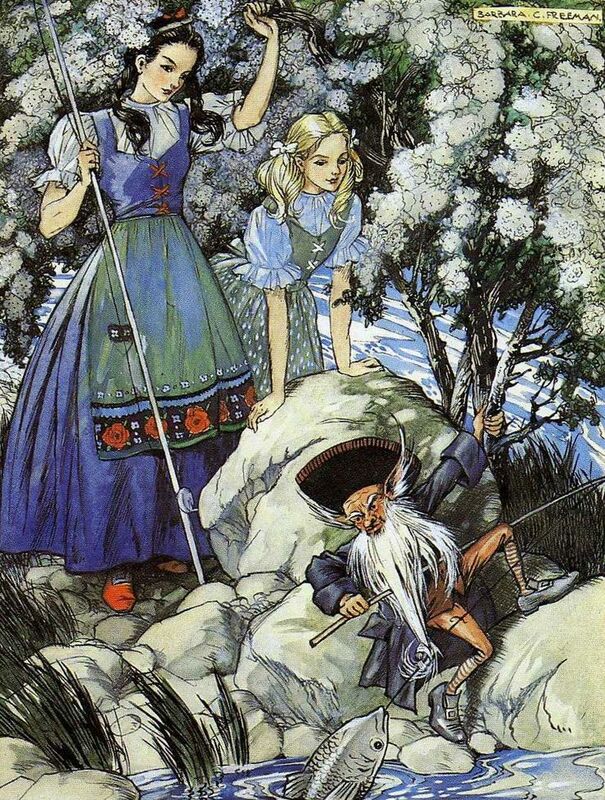 As can be seen in fairy tales of the time, such as Cinderella and Puss in Boots, wearing a gorgeous gown or fashionable boots meant the wearer was important and heroic. 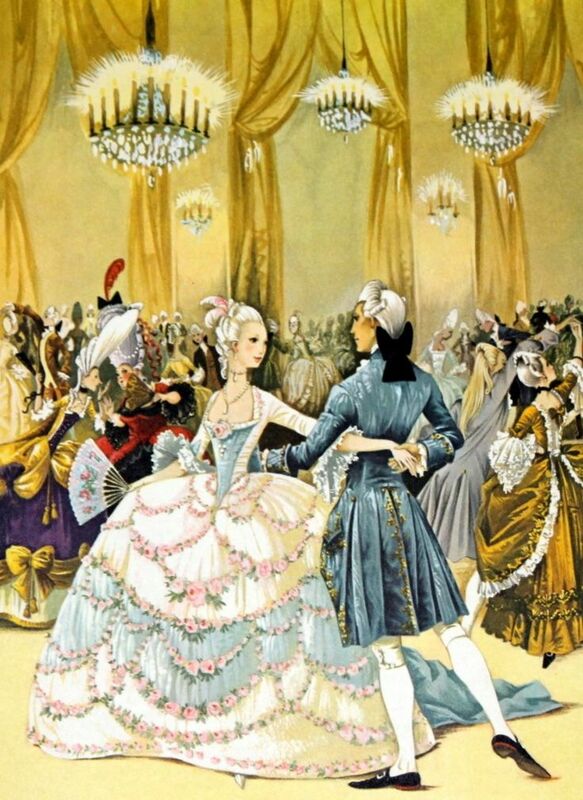 Two French Cinderella stories were published in 1697, one written by Charles Perrault and the other by Marie-Catherine de Barneville, Comtesse d’Aulnoy. 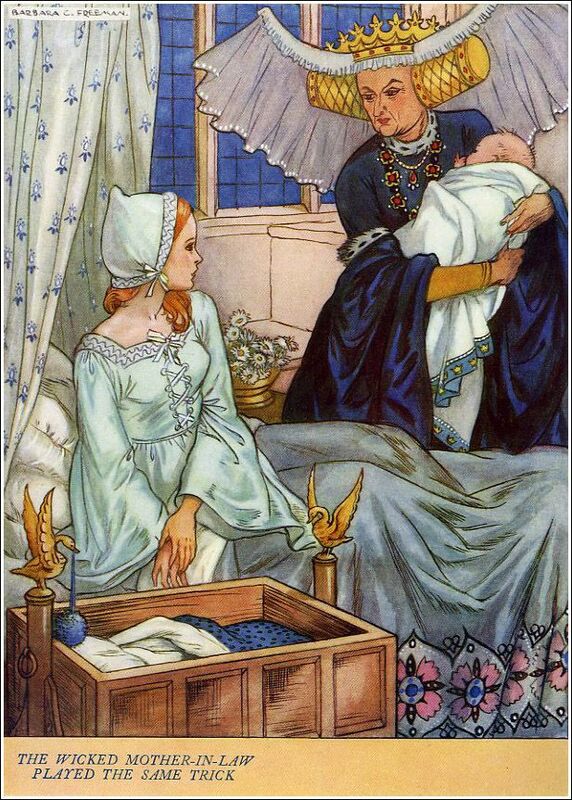 D’Aulnoy’s story had an especially strong emphasis on the importance of fashion; the dress and shoes were the main characters and Cinderella was only there to carry the clothing. 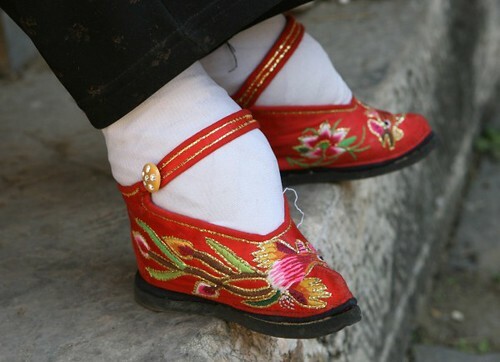 In the story, when Cinderella comes to the ball, she never even meets the prince, but simply shows off her glamorous gown and “red velvet mules completely encrusted with pearls;” a pair of glamorous shoes she would never intended to lose. On the other hand, in Perrault’s story, Cinderella slips out of her shoe in an attempt to lure the prince after her as she knows its beauty will attract him. In D’Aulnoy’s story, she extends the obsession of fashion to men as well, as Prince Charming finds Cinderella’s lost slipper and becomes entranced by its petit size and exquisite craft. He becomes devoted to and enamored by the shoe, not eating or leaving his room for weeks. The doctors his desperate parents send for declare him in love – Prince Charming himself states that it is the shoe with which he is in love. D’Aulnoy’s story centerpieces clothing and the Parisian fashion industry, making it magical and desirable by its fairytale setting. "Charles Perrault wrote the story of Puss in Boots around the same time. In the story, the youngest son of a miller is presented, as his inheritance, a cat. Puss is not particularly extraordinary until, upon his request, the son presents Puss with a pair of boots and a pouch. Once Puss has these, he is able to perform heroic deeds and impress the king with many gifts. When the king is riding in the woods, the cat tricks him into believing the miller’s son is a Marquis, whereupon the king gives the miller’s son a set of expensive clothes because Puss has told him that the Marquis’s were stolen. Eventually the miller’s son marries the king’s daughter and the cat becomes a grand seigneur. Just as Cinderella transforms into a high-born lady when she wears a gorgeous gown, Puss is transformed into a witty and courageous cat that is able to procure many great privileges for his master when given a pair of boots. The son’s relationship with the king is even firmly established by the king presenting him with the clothes of a courtier to wear. These clothes seem to transform the peasant to a courtier just as Cinderella’s did. 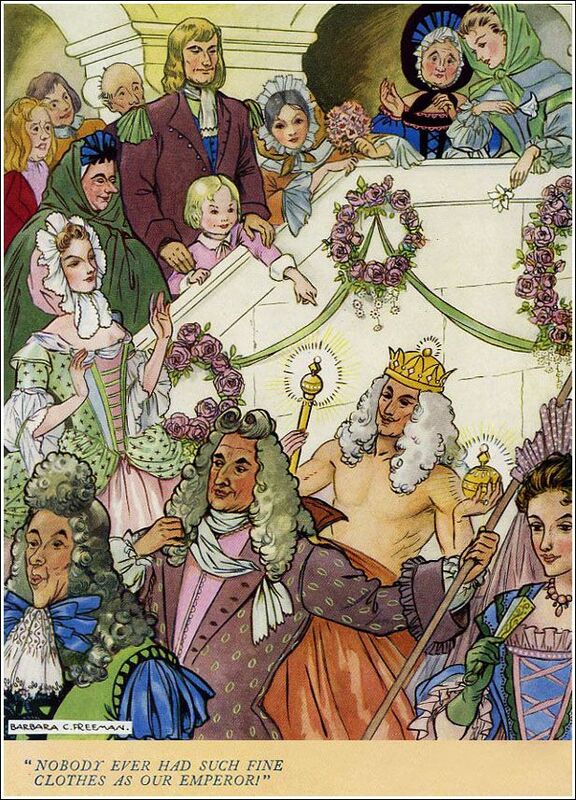 Perrault’s story emphasizes “the virtues of dress, countenance, and youth to win the heart of a princess.”  Perrault also mentions, briefly, that the truly noble need not strain themselves. When Puss jumps up onto the ogre’s roof in fear, he finds it difficult because his boots are not suited for walking on tiles. Therefore the emphasis is especially strong on how, while wearing such fancy boots, he cannot do hard work because of course Puss’s boots would never be designed for labor because the nobility has no need to work. 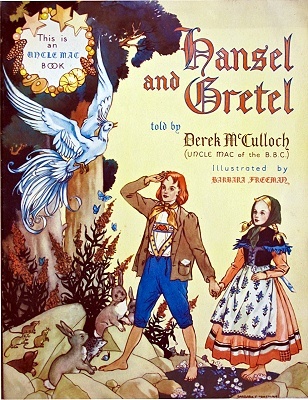 "Perrault wrote many other stories, including Sleeping Beauty, Little Tom Thumb, and Ricky of the Tuft. All of his stories include similar messages. He calls on women to be beautiful, fashionable, and to properly maintain her attire. Any woman of importance or good qualities in Perrault’s story posses beauty or, in the case of Cinderella, are able to swath themselves in beauty. Men in his stories are ambitious and clever, always climbing the social ladder. Puss especially embodies the perfect bourgeois, “who serves his master with complete devotion and diligence” and is ultimately rewarded. Perrault encourages men to be loyal to the king and serve him well in order to gain his favor, just as Louis did through competition. Through his stories, Perrault hoped to portray, either by example or counter-example, the correct mannerisms and personalities of courtiers as well as what material items they required to achieve this. D’Aulnoy’s Finette Cendron and Perrault’s Le Maistre Chat, ou Le Chat Botté loudly proclaim fashion as the most influential and important industry and almost all one needs to become rich and powerful." 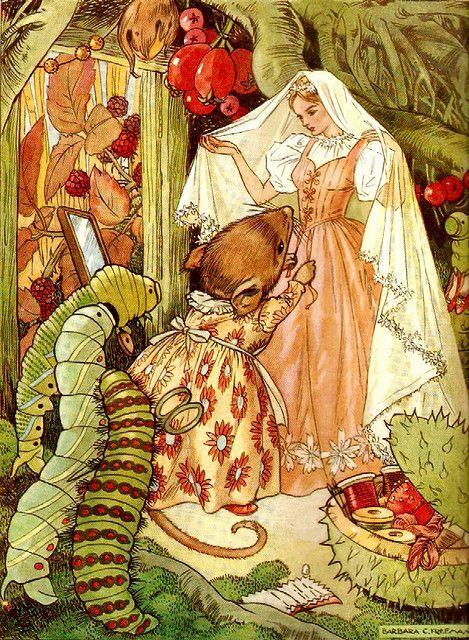 It's true that fashion is a huge theme in Perrault's fairy tales, as the topic was so important for his time and culture. However I find it interesting that the author (I can't find the author on the site...?) interpreted all of Perrault's writing on fashion literally. Fairy tale scholars generally see Perrault's writing as being highly satirical. I'll admit I have a difficult time wrapping my head around his writing being actually feminist, since his morals come across as so offensive to us today. But as you readers have pointed out, his morals are just so over the top and ridiculous, and at the time you couldn't outright criticize the King, you had to do it subtley. "The princess was already fully dressed, and in most magnificent style. As he helped her to rise, the prince refrained from telling her that her clothes, with the straight collar which she wore, were like those to which his grandmother had been accustomed. And in truth, they in no way detracted from her beauty. "They passed into an apartment hung with mirrors, and were there served with supper by the stewards of the household, while the fiddles and oboes played some old music and played it remarkably well, considering they had not played at all for just upon a hundred years." Either way, the conclusion is the same, that fashion was incredibly important in France at the time, and this is reflected in French fairy tales. 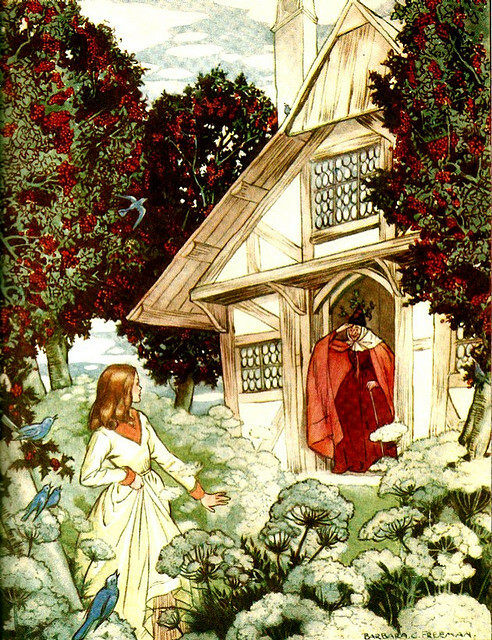 Barbara C. Freeman (1906-1999) was an English writer and artist who illustrated several fairy tale book collections. Her illustrations are wonderfully detailed and engaging. This post would have been perfect right around Halloween. But here in the Northern Hemisphere, our days are still getting gradually darker and darker so the spooky aspect of stories is still applicable! This article in the Guardian is about sleep paralysis, a condition in which you are somewhat awake during the night, but your body is still paralyzed in a dream state. What results is a terrifying feeling-people with this condition may notice noises or shadows on the wall but be unable to do anything. The brain, being so close to sleep, may continue to invent images, causing people to hallucinate figures they are already afraid of, often folkloric monsters, vampires, or ghosts. People will also experience heaviness on their chests, leading them to think there is something sitting on their chest, such as in this painting "The Nightmare." "In many cultures, humanity’s attempts over the centuries to seek explanations, have led to deep- held superstitions about witches and dark magic. Such fairytales act as a primer for the hallucinations. “It creates a positive feedback loop,” Jalal explains. “So you’ve grown up being told by your grandmother that spirits and demons inhabit your village after dark. You wake up during REM sleep, you see some kind of a shadow, and you starting panicking, creating more body image hallucinations which your mind interprets in this cultural narrative and so you perceive a demon coming towards you. And then you go to bed the next night even more afraid, so it happens again, and you perhaps start to believe you’re possessed.”"
It reminds me that, even in this technological and scientific age, there is so much that is still a mystery. Sleep and dreaming itself is pretty crazy: your body shuts down and hallucinates for a few hours. 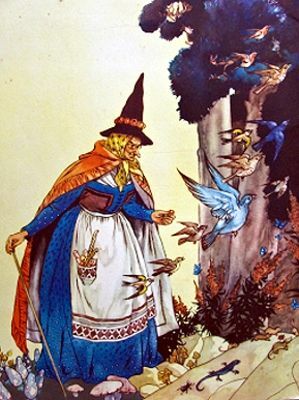 While we sometimes tend to look back on older generations who believed in fairies, witches, vampires, etc., we may see them as simple and unintelligent, but really, in many cases they were just trying to make sense of this crazy world we live in. Watching nature shows you often see animals that are just as amazing as fictional ones. There are will-o'-the-wisps, or mysterious lights sometimes seen above swamps, and gravity hills-places where you can seemingly watch objects roll up a hill. Even we who might know the current scientific explanations for things like this can find them hard to believe, how much more for earlier generations who didn't have that knowledge! 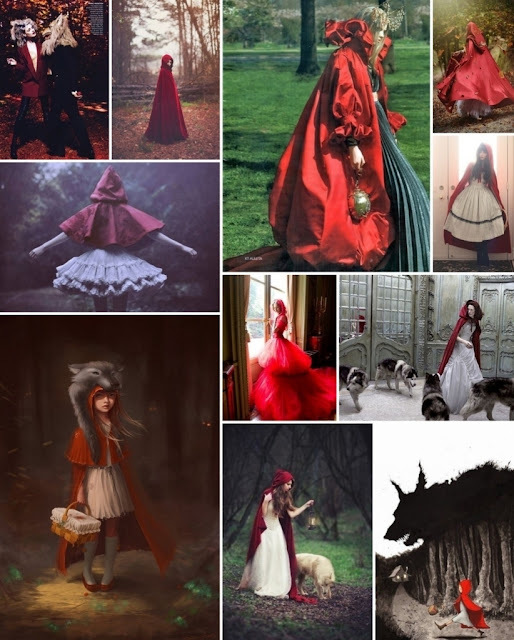 The famous Red Riding Hood we are all familiar with was originally, in Perrault's story, a chaperon, or French headgear. The chaperon had begun as a hood or cape, but evolved during the hundreds of years it was fashionable. "By about 1480 the chaperon was ceasing to be fashionable, but continued to be worn. The size of the bourrelet was reduced, and the patte undecorated. St Joseph could, by this stage, often be seen with the evolved form. By 1500 the evolved chaperon was definitely outmoded in Northern Europe, but the original hood form still remained a useful headgear for shepherds and peasants. By this time the evolved chaperon had become fixed in some forms of civilian uniforms for lawyers, academics and the members of some knightly orders. In these uses it gradually shrank in size and often became permanently attached to the clothing underneath, effectively just as an ornament. In Italy it remained more current, more as a dignified form of headgear for older men, until about the 1520s." Here's an interesting "Frog Prince" tale from Korea, this one does not tell the story from the perspective of the bride. We also get a back story for the frog, which you don't often see. Once there was an old farmer, Mr. Pak. He was poor but worked hard to fish and grow rice. He and his wife were childless and wondered what might happen to them in the future. Gradually the farmer started to notice that there were less and less fish in his pond, and less water in the lake. Without fish or water, Pak and his wife would have no resources and could starve to death. The farmer went in search of the cause of his trouble and found a large bullfrog. In anger, Pak brought down curses upon the frog and his line of ancestors. The frog did not seem to mind the curses, but instead asked to come home with the farmer. The Pak was hesitant, but the frog promised that the farmer would be glad someday. Pak thought his wife might be glad to have someone else to talk to. He brought the strange guest home with him, and at first Mrs. Pak was horrified to board a frog. But she soon became glad of their guest, who told wonderful stories and was very pleasant company. "Indeed, she felt almost like adopting Froggie as her son." The next morning, the couple woke to find the frog singing on their porch, and as he sang, the music was bringing them everything they could have wanted-valuables or jade, gold, and silver; clothes and hats, gowns and jewelry, furniture, and a polished metal mirror; food and delicacies and even a new house to put all these things in. 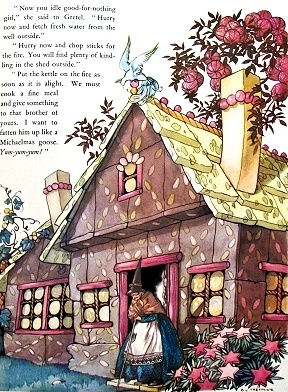 The couple was never hungry and they enjoyed all their new blessings with their friend the frog, who continued to entertain them with stories, as Mrs. Pak told the frog about the village, especially the beauty and charm of the young Miss Peach. Miss Peach was the most beautiful young woman, and her father was rich, but severe. When someone offended him, he would have his servants beat them until they were bloody and crippled. So it was to the farmer's horror that one day the frog declared he wanted the farmer to get him Miss Peach for a wife. Pak tried to convince the frog not to send him on this mission, but the frog would not be satisfied until he had Miss Peach. So reluctantly, Pak went to the Poom mansion to ask for Miss Peach. Mr. Pak told of all of the good qualities of Miss Peach's potential suitor, and Mr. Poom was impressed. He insisted on knowing the name of the suitor, to which Pak replied that he had forgotten the name, because he had "so long thought of the suitor's grace and accomplishments." Poom named every great Korean family name, and was suspicious that the suitor did not belong to any of these families. Eventally Pak had to admit that the suitor had no family name, for he was a frog. Poom was furious and ordered his servants to bring out the whipping bench. The servants were just about to deal the first blow when the sky darkened, lightening and thunder flashed, and floods and hail the size of eggs began to pour. Poom ordered his men to hold off, and immediately the foul weather ceased and the sun shone. Poom was impressed at this, and agreed to give the frog to his daughter, but did not tell her the strange news about her suitor. She was made ready for the wedding, and "according to custom, her eyes were sealed shut and covered with wax, for a Korean bride sees nothing of her husband until the end of the feast, when she meets him in the bridal chamber." When the new bride finally laid eyes on her new husband, she was furious. The frog handed her a pair of scissors, and asked her to rip open the skin of his back from shoulder to thigh. "In bitter disappointment at being married to a frog, she seized the scissors and almost viciously began to cut from nape to waist." Yet underneath she saw silk, and out of the frog skin came a handsome prince, "the ideal of her dreams." The next day the former frog told his foster parents his story. He had been the son of the King of the Stars and was cast out for some offense, forced to live on earth as a frog, until he accomplished three tasks: to drink up all the water in the lake, eat all the fish, and win the most beautiful woman in the world for a bride. Having done these things, he took his bride in a chariot back to his kingdom in the stars. "From this time forth a new double star was seen in the sky." 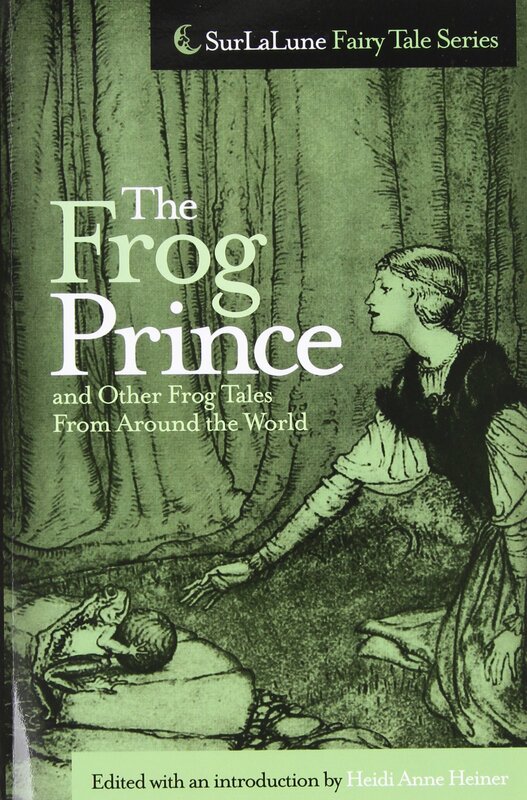 Full text available in Surlalune's Frog Prince and Other Frog Tales From Around the World, summary by me. I seem to like folklore variants of the Frog Prince much better than the Grimms' story. It always bothered me that the daughter was so whiny about the frog, yet rewarded. Yet on the other hand, who can blame her? No one wants a slimy pet eating off your plate or sleeping in your bed. But I didn't like that contrast between herself and the King, Mr. "Always Keep Your Promises" (easy for him to say, he didn't have to bring the frog into his bed). I like that in this story, everyone is initially repulsed by the frog, yet they change their minds, and he gives them whatever they most desire. He promises the farmer to make up for what he lost, and gives him much more; he provided companionship and conversation to the farmer's wife and ultimately became like the son they never had; he impressed Poom with his power, and gave Miss Peach the ideal husband and a heavenly palace. It's not only a reminder not to judge by appearances, but that idea that sometimes the worst things in life are making way for better things to come.